The only English-language guide to Sochi thorough enough that you don’t even need to attend the Games. The first winter Olympics in Russia is only 79 days away, and RBTH is ready to get you started for the snowiest event of the year at Russia’s best seaside resort. The new Sochi section will lead you through the Games, and provide you with useful travellers’ tips and curious facts on the Game’s location. 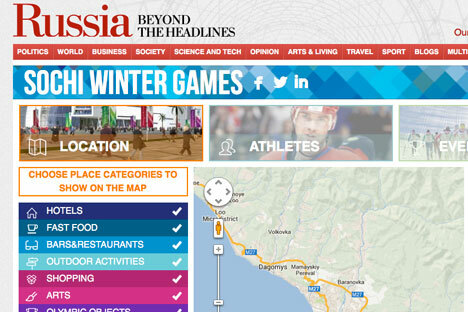 We’ll help you survive in Sochi, even if you don’t know a word in Russian. Wondering which means of transport is cheaper and faster? What local dishes you should try? Or where to go and what to wear in Sochi? We’ll give you up-to-date advice. And finally, are you curious about what will happen to the Olympic stadiums after the Games finish and how the Sochi 2014 Olympic medals are made? All that and many more will be featured in the new section. We’ll also give you an inside look at the way Sochi is organized from the point of view of athletes and volunteers. And RBTH will keep an eye on all the events and ceremonies directly from Sochi. Closer to the opening ceremony, we’ll offer our readers the opportunity to closely follow their favorite sport with our daily event updates and details about upcoming competitions. Together with the athletes profiles and their twitter updates, the reader will get the whole picture on what is happening during the games. All the events of the Olympics will be supported on all the RBTH platforms, so you’ll never miss out. Don’t forget to follow RBTH in social media and subscribe to our newsletters to enjoy all that the Games have to offer with us.